whence they came and whither they go." In the late 1980’s I was exhibiting my fine art and restoration services at a conservation conference in Baltimore, Maryland when a lady entered my booth clutching a blackened piece of bent and rusted metal. What used to be a treasured image of a female had been reduced, over the years, to a ghostly silhouette highlighted by gold leaf paint over earrings, a broach and a ring. On the back of the metal was etched the date December 1877. 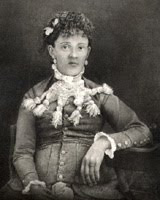 Having taken the tintype to several other conservators who claimed nothing could be done to bring back the image of this important ancestor, the woman had been referred to me. Because of my fine art and portraiture skills the client hoped that, at the very least, I could visualize enough in the aged metal to draw or paint a portrait of the woman. The family desperately wanted to see what this woman looked like. It seemed that the woman in the photograph passed away in 1923 leaving fourteen children. The youngest of these children was my client’s father who would turn eighty years old on his upcoming birthday. Because of the span of years between children and the early century death, no one currently alive had ever seen their Grandmother. 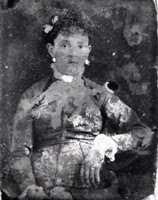 This was the only known photograph of her and it was very important to the family to know what she looked like and what the photograph could tell. I asked the woman to leave the tintype with me so I could return to my studio and further investigate options and costs. If she were patient I just might have some ideas. A tintype, also called a ferrotype, is a photograph made by creating a direct positive on a sheet of iron metal that has been blackened by paint, lacquer or enamel. No tin in a tintype, but this blackened metal was then coated with a photographic emulsion, placed inside a camera and exposed to light through a lens that would capture a direct image in the silver particles in the emulsion. Over time our tintype had been rubbed, scratched and rusted. The right wrist area of the woman was all of the original emulsion left on the surface. Only a latent image remained to be seen in the metal. 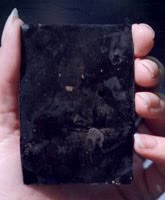 At some point it appeared someone had tried to clean the surface and used a harsh chemical that had dissolved the surface in the process leaving several areas that exposed the bottom black layer of paint. “Above all, do no harm” is a conservator’s mantra, but something not always practiced by well-meaning, but unskilled laymen. I prefer not to divulge the process which I developed to bring back this, and other, darkened images, but suffice to say I was able to photograph the metal in a liquid solution that allowed me to focus on the embedded image in the metal rather its surface. Processing the film and dramatically filtering the resulting negatives, I was able to produce a print which could now be restored to its original captured condition. I wouldn’t put the final product on metal, but would be able to supply the family with aged looking fiber base, toned duplicated prints. What an exceptional treasure this project turned out to be for more reasons than one. Look closely at the images shown above and you will see some definite genealogical features and..... one of the ugliest crocheted neck scarves I have ever come across! When I phoned the client to report on the success of pulling a rescued image, I was concerned about the size and manliness of the subject’s hands as well as the proportion and length of the female's torso. My client was shocked that I should question family anatomy. She assured me her female family members were not known for dainty traits. Apparently, the eldest daughter of our subject was the first female butcher on the East Coast of the United States during the early 1800’s. Score one for womanhood!! Restoration on a work print proceeded by bleaching darkened areas, darkening overexposed details and airbrushing missing pieces of clothing, hair and background. Finally, our lost Grandmother appeared before my eyes. How happy my client would be when I returned an original photographic image to her family history instead of a painted interpretation. My client and her entire family were indeed overjoyed. I received a phone call of thanks and gratitude and learned that the restored photograph had arrived just in time to be presented at the recent birthday party. Remember, our lost Grandmother’s youngest child was turning eighty and was the father of my client. Not only had a Mother been returned to her Son, but a Grandmother, Aunt and Great Aunt was returned to a family who could not track their photographic history back farther than two generations. What really amazed the family was that there were three living female relatives who were exact images of their long since gone relation. Without this restoration, and my ability to present it, no one would have ever seen family resemblances or genetic traits. At the very least it answered the question of where the size and manly features were passed down through generations. It didn’t come from male ancestors it was passed down through females. An additional joy on this project came when I entered the work into the Professional Photographers of America annual competition where the world’s finest photographic and artisan images compete for international award and acclaim. Unbeknown to me, my restored Grandmother was submitted for consideration for an outstanding award. Traditionally presented to a professional photographer for photographic excellence, the Fuji Masterpiece Award, presented by the Fuji Photo Corporation, is the highest honor given within the photographic industry. Recognizing an important contribution to the photographic industry, the Fuji Photo Corporation broke with tradition and, for the first time, the Masterpiece Award was presented to an artisan and a process rather than to a photographer taking an image. It is overwhelmingly heartfelt to accept thanks and praises from individuals who cherish my talents and work, but what an honor to be recognized by one of the top Corporations for work I do quietly and alone in the privacy of my studio. The Heirloom Art Studio continues to Bring Back Memories of Another Time. "Begin at the beginning and go on till you come to the end: then stop"
When the marketing experts began touting the praises of Blogging I not only wondered how I was possibly going to fit this task into my already overloaded schedule, but could not figure what on Earth I was going to say that would be of interest to readers. Blogging seemed synonymous with “Bleah, Bleah, Bleah”. If I were going to post Blogs what direction of thoughts would I write? What would be so compelling as to attract an audience and add something of interest to their lives? I pondered this thought for weeks until something very profound happened. On an unscheduled evening, a treasured friend phoned to bring our acquaintance up to date. Since she and I are somewhat collaborating on international genealogical projects, we quickly brought the family news up to date then got down to business discussing photographs, archives, historical data and research. Excitement and electricity reigned supreme as it usually does when my friend and I are engrossed in conversation. Put the two of us together and our husbands usually run exhausted from the room. My daughter says we are the only two people she knows that can converse for hours of time and still have to email each other because some subject was omitted. So it was with this day’s contact. That night I slept soundly but awoke far too early. My mind began to wander from one thought to another. It didn’t take long to begin reviewing the earlier conversation I’d had with my friend. The sun was just beginning to rise when it literally “dawned” on me that I had suddenly found the subject matter for this Blog. Where my personal life dedicates a great deal of time to my own family history research, my business revolves around the photographic images and lives of my customers and their ancestors. 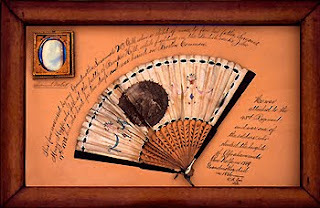 I am a professional fine artist, photographic conservator and restoration artisan. Day in and day out I retouch, restore, enhance and duplicate treasured images of other people and their past. Where passion is the current word of choice to describe one’s desire, I prefer to consider my work electrifying. Every photograph that comes into the Studio has a story to tell, a mystery to solve and a myriad of questions to resolve. 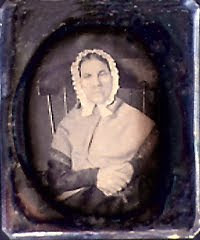 Owners in possession of photographs handed down through generations tend to have little knowledge of an image’s date, origin, construction and often subject matter. Some images are so faded or deteriorated the average person cannot make sense of the jigsaw puzzle effect of the broken pieces still remaining. They certainly have no concept of the level of skills required, skills I possess, which will bring back and preserve their family history for future generations. With this thought, it comes to light that over the past thirty years I have seen some of the most beautiful photographs and handled some of the most neglected and damaged. With each treasured image there is a story whether it is an investigation into methods of reproduction and restoration, an historical search of setting, clothing and image details or an attempt to pinpoint the genealogy of those peering out at the viewer forever frozen in time. Throughout this Blog I will bring you some of the more exciting tales and images surrounding my work. Where to begin was not a question. Like the King said to the White Rabbit in Alice and Wonderland, we will begin at the beginning and go until we come to the end. The most obvious choice for the first story concerns the oldest photograph ever brought to the Studio. We will begin with the start of photographic history and, in fact, the early history of the New World, and move through time and generations of fascinating people, places and events. I would very much like to thank my dear friend, Henrietta, for sharing my unending enthusiasm for historical and genealogical research and investigation. Special thanks for all of our conversations each of which re-energizes my unending excitement and focus. Thank you, my friend, for phoning and this time reminding me why the sun rises in the morning. Sit back, grab another cup of coffee or make a lovely cup of tea and read on. We are about to take a journey that will................Bring Back Memories of Another Time.